Injuries of the foot and ankle are common among recreational and competitive athletes. Like most sports-related injuries, management typically entails a period of rest, aggressive rehabilitation and return to early competitive activity without compromising long-term functional outcomes. Timing of intervention and return to play is often a prime consideration with respect to sports, and thus particular emphasis is often given to early diagnosis and treatment in the athlete. 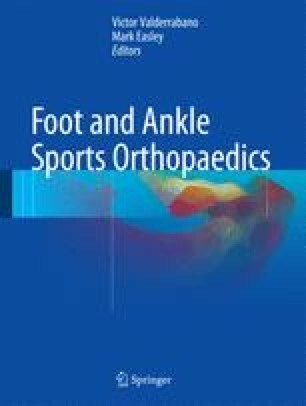 A combination of intrinsic and extrinsic factors may predispose athletes to certain injuries in the foot and ankle. Common acute athletic injuries to the foot and ankle include ankle sprains, ankle fractures, turf toe, Lisfranc injuries, and overuse syndromes ranging from Achilles tendonitis to stress fractures. As in all of sports medicine, the goal of treatment and surgical decision-making is to ensure safe return to play and to reduce the risk of further or recurrent injury, aligned with the goals of coaches, teams, and the athlete.